Well thank you, AJP! They are lovely flowers. 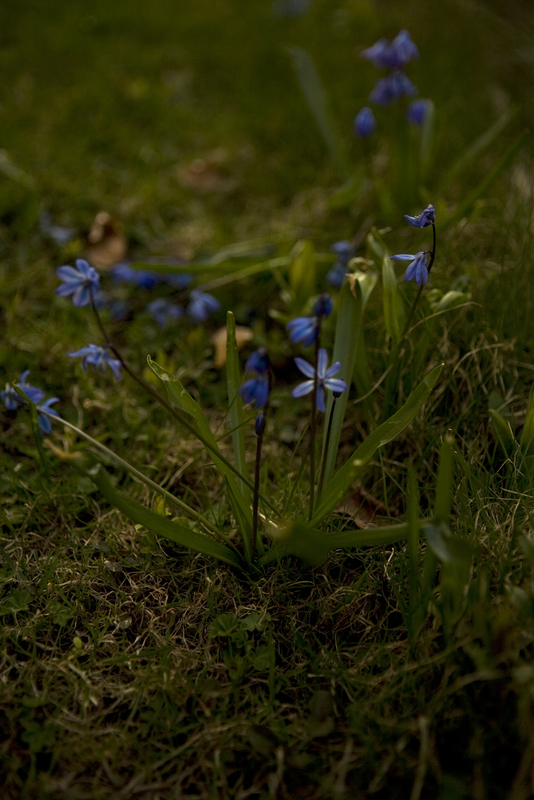 Spring is finally beginning here in Nova Scotia, and the neglected area of grass behind my house is full of forget-me-nots. There seem to be more and more each year. That must be because I don’t usually mow the “lawn”, let alone use weedkillers. 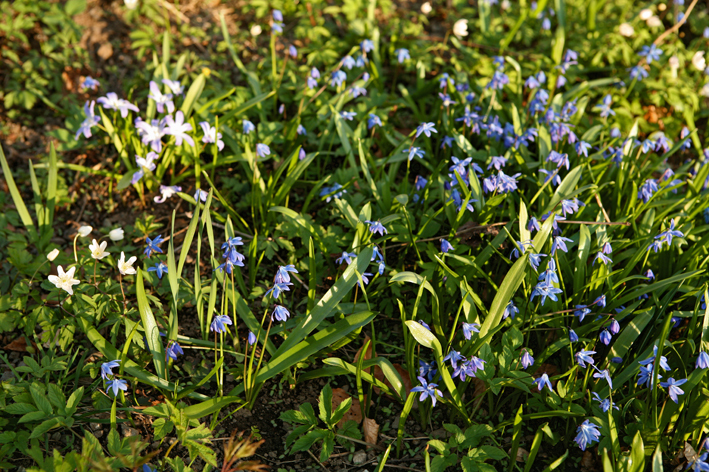 We haven’t had any forget-me-nots yet although I see their green leaves all over the place. The similarities between our lawn floras (florae?) are remarkable. 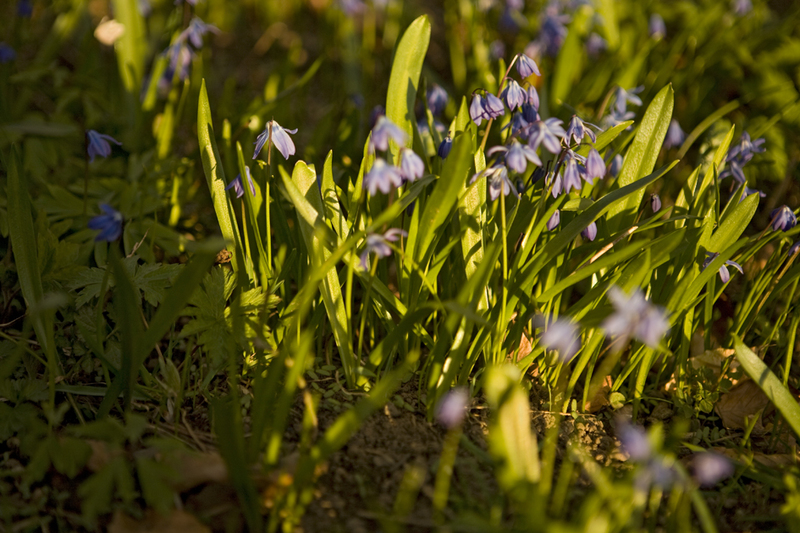 Especially when considering the differences between our lawn faunas (faunae?). I seem to remember flora and fauna used for both singular and plural meanings, in English at any rate. They’re like pluralia tantum with the trappings of singularia. The plurals of both can end in either –as or –ae. Yes, they can, but do they in fact ? As far as I recall from my reading over the years, “fauna” and “flora” are like “scissors”, in that to refer to a kind of fauna you have to say exactly that: “kind of fauna”, as in “pair of scissors”. In other words, “fauna” and “flora” appear to be Latin singular forms, but their common use is to refer to pluralities. Grum, there’s a US usage that I’ve heard: “a scissors”. Perhaps certain people said it was bad, I don’t know. It’s not used in Britain. 1859 DARWIN Orig. Spec. xii. (1873) 323 A narrow isthmus now separates two marine faunas. 1859 DARWIN Orig. Spec. xii. (1873) 329 The floras of distant continents would not by such means become mingled. 1877 LE CONTE Elem. Geol. (1879) 155 There are.. geographical faunae and florae and geological faunae and florae. The 19th century ! I’m talking about nowadays, where in English the forms “floras” and “faunae” are pretty rare in the kind of popular-science zoology I have read. The 21st-century OED hasn’t gotten around to redoing F yet, and I don’t feel like doing a thorough Google search at the moment, but does Guide to Standard Floras of the World (2001) do anything for you? Guide to Standard Floras of the World ? There’s a Scottish girl’s name Flora, you know. Also, that’s the second edition. The first edition was 1984. A lot has changed since then. Advances in Botanical Research is from 2001 and uses “floras” repeatedly; recent enough? Oh, and here’s Paleontology of the Upper Eocene florissant formation, Colorado, which also uses “floras” repeatedly and is from 2008. Alright, then, have it your way ! Although it does seem to be a very recent phenomenon, since all your citations are from 2000 or later. Yes, there’s a large citation gap between Darwin and 1984. But I’m giving Hat the benefit of the doubt. That knuckle-cracking is not good for the joints in men of a certain age. Yes, give him a break, he was still up at 10.52 p.m. researching this. And “Darwin” is like “Hitler”, it trumps everything else. You’re just trying to bait me into spending the whole day digging up citations for every year between 1859 and 2010. I won’t do it, I tell you. I have a life. And a wife. And cats. But no goats. I didn’t know it was plural cats. Pushkin and Lyuba (whom we usually call Loobs). We got them as a pair from the shelter in Pittsfield where we used to live; we liked them right off the bat, but we were worried about Pushkin: his back legs didn’t work right, and he dragged himself along. They assured us it was a temporary effect of recent surgery and he’d be fine. Too true; from a tiny crippled kitten he’s become a huge, swaggering cat who pushes around his erstwhile mother-figure (she’s about a year older)… until she gets fed up and hisses at him, which causes him to back away and wander off. You can see Pushkin on the upper right here, and if you scroll down you can see Lyuba. Pushkin doesn’t look like a huge swaggering cat. He looks very sleek. I notice that you can’t click on him to make him bigger as you can Lyuba, but maybe it’s just as well. At any rate, they are both beautiful cats. If that is Bonnie’s blog, you guys seem to have kept an enormous number of animals, just as we have. I think you ought to consider getting two mohair goats. Or not, of course. He was much younger then. I assure you, he’s of frightening stature now. And we look forward to getting more animals when we can afford it; a dog or two to start with, but goats would be very nice. I wouldn’t have to mow the lawn, for one thing. Dogs & goats are equally great pets in my opinion, though I also have a yearning for a few cows. Cows are so nice: affectionate, with a sense of humor. – I thought that continuing the riff on florae/floras you were going to suggest that “cats” had some other sort of plural form. Like people who say “Watch out for elephant on this highway.” Many animal it works well for; but some creature sound odd in this usage.